It seems cliché’ but the truth is, things don’t always go as planned. The best laid plans are often foiled by things that are not within our control. We do, however, get to control how we react. 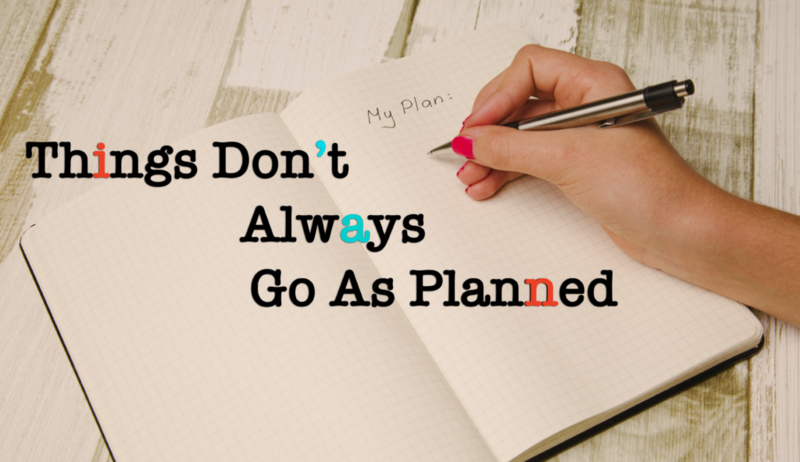 With my husband’s job, it seems no matter how well I try to plan, there are often hiccups in the road. Generally, it means I fly solo as my husband frequently gets held up at work. I mean, it really never fails. If it is important to me, he gets stuck holding over or going in early or too many people are out or, or, or! It’s been that way from day one. It is maddening, or is it? For many years, I would get so frustrated, angry or hurt when our plans were trashed because of work. I would react verbally, or with the all too familiar “I’m mad but I am not going to say anything” body language. The result would be an ugly fight, tears and pouting. None of these things improved the situation one bit. In fact, quite the opposite; things were worse because of my reaction. I can be a bit of a slow learner in the scenarios. Over the years as I learned to not react first, but take a deep breath, I have found that I am able to cope with the frustration and disappointment far better by being purposeful about my actions and my attitude. Choosing to realize that his choice would be to be with me, and choosing to realize that he is trying to do what is best for our family and choosing to understand that he is helping others are all keys in helping to improve my own attitude. I’d like to say that the outcomes are always better and there is always a silver lining, but sometimes things just stink and don’t go the way I want. By not reacting in anger, this situation that would normally turn hostile quickly in the past, never reaches those heights. It has taken some self-reflection into why the anger. Simply, because I didn’t get my way. Funny how we are so bent on getting our way sometimes that we fail to see the big picture. The big picture may be simply that I have to do without. It may also mean that someone else’s needs are greater than mine in that moment. Society is plagued by instant gratification. Things don’t always go as planned, but it’s not the end of the world. Make the most of each moment. Choose to be joyful in all things- at the very least, there won’t be a fight. Purpose! The Value of Time. © 2019 #TabSaid. Designed by Uptown Motives.